I’m way behind with writing reviews of books I’ve finished recently, so here are a few. 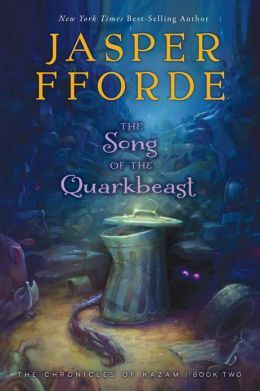 The Song of the Quarkbeast, by Jasper Fforde – The sequel to The Last Dragonslayer continues the adventures of Jennifer Strange, the orphan girl who manages a magical employment agency. The agency is pitted against a competitor called iMagic, whose head sorcerer Blix obviously isn’t playing fair. Also involved in the plot is King Snodd, the ruler of Hereford in a Great Britain that was never united. Snodd is a tyrant who serves as an antagonist in this book as well as the last one, and one of my favorite jokes is that his brother who serves in an official position due to nepotism is actually called the King’s Useless Brother. Some elements introduced in Dragonslayer are expanded upon here, including Quarkbeasts (you probably could figure that one out from the title) and the Transient Moose. In addition, we finally see some trolls, and learn that they’re not quite the menace King Snodd portrays them as being in order to maintain the military-industrial complex. As bizarre as this series is so far, it’s actually not quite as anything-goes as the Thursday Next or Nursery Crime books. 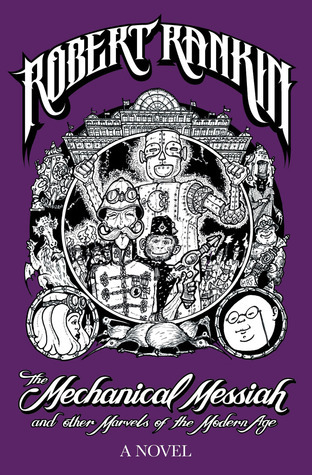 The Mechanical Messiah and Other Marvels of the Modern Age, by Robert Rankin – Speaking of books that are bizarre but still not quite as wacky as others by the same author, this one would qualify in this category as well. It’s actually the sequel to The Japanese Devil Fish Girl and Other Unnatural Attractions, but I haven’t read that one yet. It stands on its own pretty well, though. Rankin often incorporates some steampunk themes into his books, and brought them to the forefront with the technologically advanced Victorian era in The Witches of Chiswick. The setting of this book is quite similar, with nineteenth century England having spaceships, ray guns, robots, and computers. Part of the premise of this series is that H.G. Wells’s The War of the Worlds chronicled an actual historical event, and the British subsequently wiped out the Martian civilization. On the other hand, they were able to establish diplomatic relations with the inhabitants of Venus and Jupiter. Colonel Katterfelto, who had served in the war against the Martians, has taken up with a talking monkey named Darwin and become obsessed with building a robotic messiah to usher in a new age. Meanwhile, the headliners of London’s foremost music hall have been dying under mysterious circumstances, and private detective Cameron Bell is on the case. Described as sort of a combination of Sherlock Holmes and Mr. Pickwick, Bell is a pretty typical Rankin hero, largely self-centered and not entirely honest, but at the same time quite intelligent and ultimately on the side of good. Several historical figures feature in the story, including Nikola Tesla, Charles Babbage, Joseph Merrick (the Elephant Man), and Aleister Crowley (whom Rankin’s dad apparently knew). Rankin acknowledges that the timeline involving these people doesn’t always work out, but I think we can chalk this up to artistic license. Another major character is Alice Lovell, who is the Alice of the Wonderland books due to a bath in hallucinogenic soap made by her Uncle Charles. As can be expected, the plot is rather convoluted, and culminates in a battle with a demonic entity. It actually kind of makes more sense than a lot of Rankin’s recent work, however, which is saying something when it sets some of the events of the Bible on Venus. I didn’t notice that many of Rankin’s typical running gags either; I don’t recall anyone ever saying that something was “a tradition or an old charter or something,” and there’s no sign of Hugo Rune, Count Otto Black, Lazlo Woodbine, or Fangio. One old joke that showed up in this book is the one about a Thermos keeping hot things hot and cold things cold, and somebody (in this case Darwin the monkey) asks how it knows which is which. I was thinking about that joke recently, because it relies on a specific description of the Thermos that I don’t recall coming across EXCEPT as a setup for the joke. If you were to just say it preserves temperature, the joke wouldn’t work. Was saying that it keeps hot things hot and cold things cold a tagline that Thermos used at one point? This entry was posted in Authors, Book Reviews, Chronicles of Kazam, Humor, Jasper Fforde, Lewis Carroll, Magic, Robert Rankin and tagged aleister crowley, alice lovell, cameron bell, Charles Babbage, colonel katterfelto, darwin the monkey, h.g. wells, jennifer strange, king snodd, quarkbeast, sherlock holmes, the mechanical messiah and other marvels of the modern age, the song of the quarkbeast, the war of the worlds, thermos. Bookmark the permalink.